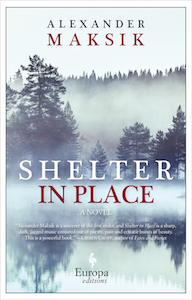 Set in the Pacific Northwest in the jittery, jacked-up early 1990s, Shelter in Place is a novel about the hereditary nature of mental illness, the fleeting intensity of youth, the obligations of family, and the dramatic consequences of love. ...so audaciously original, so inventive and let’s be honest, so sort of weird that you want to put it in the hands of just about everyone you know ... stunningly unsettling ... Maksik’s writing has the strange, dangerous gleam of madness, as Joe pivots from normality to mental illness. Maksik is a good writer. His characters are credible, he excels at evoking the mood of a particular time and place, and there’s an impressive range of material across his three novels. So it’s a shame he has drunk the postmodernist Kool-Aid ... Joe’s shifting relationship with his father is generous and unexpected; Maksik has an expansive and affecting vision of human capacity. He also evokes time and place particularly well — early 1990s Washington here is as vivid as Santorini or Paris in his other books. If the postmodernism could be stripped away, the origins of Joe’s bipolar disorder examined more, the metaphors of bird and tar not relied on so heavily and the denouement cut down from 80 pages to 20, Shelter in Place could be a good novel instead of the merely interesting one it is now. Shelter in Place is an absorbing, frustrating psychological study that goes deep into the forest but doesn’t do enough to distinguish one tree from another. The emotional insight is there but the characters remain sketchy, figures circling around Joe’s beautiful, twisted mind. What did you think of Shelter in Place?